Jewish settlers who have been living illegally on lands usurped from the Palestinian Arabs in the West Bank and Gaza Strip have committed, and continue to commit, terrorist acts and crimes against the Palestinian Arab population. The settlers who have immigrated since 1967 from the United States rank among the most fanatic and violent. They are incited and financially subsidized by the Israeli authorities and the World Zionist Organization. In many cases the Israeli authorities fail to investigate crimes committed by settlers against Palestinians and attempt to cover up most reported cases. When Jewish settlers commit heinous crimes the charges are invariably reduced, for example, from "murder" to "manslaughter." On the rare occasions when a settler is convicted for a crime, his sentence is seldom commensurate to the gravity of the crime he committed, and that lenient sentence is usually suspended or drastically reduced. As soon as the furor surrounding a case has diminished the convicted culprit is often released from prison with his sentence commuted. The "double standard" of Israel's so-called justice, by which Palestinian Arabs received draconian punishments for minor offences while Jewish settlers receive a mere "slap on the wrist" for far graver offences, amounts to a licence to the Jewish settlers to perpetrate crimes, including murder and kidnapping, against Palestinian Arabs which would not be tolerated in any civilized society. Indeed, the Zionist authorities punish the victims more severely than they do Jewish settlers who commit the crimes. Jewish settlers have engaged in the following types of terrorism against Palestinian civilians in the West Bank and Gaza Strip since the establishment of Jewish settlements in those areas: murder, attempted murder, kidnapping, assault, shootings, trespassing, theft, looting, arson, vandalism, provocation, attacks against public and holy places, harassment and intimidation. The number of these crimes has increased significantly since the mid-1970s, escalating with the attempted suppression of the Intifada after December, 1987. These crimes are committed with the acquiescence and tacit encouragement of the Israeli occupying authorities, which amounts to the official sanctioning of the crimes committed by Jewish settlers. Evidence has surfaced concerning the interlocking relationships of Jewish settler terrorist groups and high circles in the Israeli government, military forces, and security services which indicates that Israeli officials have been accomplices in the commission of some Jewish settler criminal acts. The Israeli Government's financing of the settlers has contributed to their militancy and disregard for local and international law. Ze'ev Schiff argues that "the settlers are sustained by Israeli taxpayers and, indirectly, by American financial aid. Without this assistance and without the army, they cannot hold on." (4) Indeed, in certain areas of the West Bank, Israeli government subsidies to new settlers average 75-100 percent of the total value of a housing unit. A Jewish settler can actually purchase an apartment in the Jerusalem area for about $2,500! 4. Widespread public support and sympathy for the settlers, including those convicted of murder and other terrorist activities, has been another source of encouragement for settler violence against the Palestinians. In spite of unequivocal condemnation of the settler terrorist network by key Israeli officials and public figures, a significant segment of Israeli society justified the existence and the criminal activities of the group. After the arrest of 30 members of the Jewish terrorist network in 1984, a lobby was formed in the Israeli Knesset including some 50 members of that 120-member body, to seek financial and political support for the terrorists and their families. Statements calling for amnesty for the terrorists were issued by many Israeli politicians and public figures including then Foreign Minister Yitzhak Shamir, the chief rabbis of Israel and a host of Knesset members representing the Likud, Techiya, Kach, and several religious parties. Knesset member Yuval Ne'eman also justified the attack which maimed Mayors Shak'a and Khalaf by arguing that they belonged to the National Guidance Committee. "They were PLO representatives in the territories and leaders of incitement against Israel ... (they) are guilty ..." he added. (15) Foreign Minister Yitzhak Shamir described the Jewish terrorists as "excellent boys who erred," and called for their pardon. (16) Others called them Israel's "finest boys" and "loyal sons." Between 1980 and 1984, according to Dr. Jan Abu-Shakrah, an authority on Israeli settler terrorism in the Occupied Territories, settler terrorism has resulted in 23 Palestinian deaths, 191 serious injuries, 38 abductions and hundreds of other serious injuries to life and property throughout the temtories. (19) Table I, based on Abu-Shakrah's research, summarizes reported and confirmed acts of violence committed by Jewish settlers against Palestinian civilians during the period 1980-1984. 1. To harass and intimidate the Palestinian population of the territories to force as many as possible to leave their homes and lands as a prelude to taking over their property. 2. To pressure the Israeli government into committing itself to further settlement activity in the occupied territories. 3. To obstruct any form of territorial compromise in exchange for peace with the Arabs. Therefore, there has been a significant upsurge in Jewish terrorism during periods of intensive diplomatic activity involving the fate of the occupied areas. 4. To create an environment of political fear and blackmail, both in Israel and the territories, which is conducive to the annexation of the West Bank and Gaza and the imposition of Israeli sovereignty over them. (a) Reported acts of settler terrorism are only a fraction of the total terrorist campaign waged against the Palestinians under Israeli occupation. Most Palestinian victims simply do not bother to file an official complaint with the Israeli military authorities, whose record on such matters has not increased Palestinian trust in the prevailing system of justice. In some categories, only 30 to 50 percent of all incidents are actually reported or documented. (b) Most reported acts of violence by Jewish settlers have remained uninvestigated and their perpetrators unpunished and free to continue their relentless campaign of terror against the indigenous Palestinian civilian population. Only a small number of cases have been investigated because of the fragmented and inconsistent legal system under Israeli occupation. the undefined matter of jurisdiction over illegal activities by Jewish settlers, and plain negligence and complicity on the part of the military and police authorities. (c) The settlers and their supporters often claim that their vigilantism is necessitated by Israeli government apathy visa- vis Palestinian "terrorism." However, the pattern reflected in Table I, with the significant upsurge in Jewish terrorist activity in 1982-1983, indicates exactly the opposite. Violence against the Palestinians increased significantly in the aftermath of the Israeli invasion of Lebanon which devastated the Palestinian community in that country, and as the Israeli military authorities enforced their "iron fist" policy in the occupied territories. Thus, the settlers seem to get more aggressive and violent as Israeli policy toward the Palestinians becomes more oppressive and intransigent rather than lenient and permissive as claimed by settlers. (d) As to the settlers' argument that "Arabs understand only the language of force," and that settler vigilantism is the only way to keep Palestinian nationalism at bay, the same data accumulated by the above mentioned reports suggest that increased oppression by the military government, such as its iron fist policy, and acts of vigilantism by Jewish settlers have been coupled with an undeniable increase in Palestinian resistance to occupation. Israeli official statistics acknowledge a pattern of growth in Palestinian resistance in 1983, 1984 and 1985 -the same years witnessing increased settler vigilantism and Israeli military crackdown on the Palestinians. This issue might require further research and documentation; however, it is clear from the existing data that settler terrorism has not succeeded in quelling Palestinian resistance or in subduing Palestinian nationalism. Killings: As mentioned above, there were 23 incidents of murder committed by Jewish settlers in the occupied territories. The Palestinian victims included 11 children and 12 adults. Two thirds of the cases involved Israeli military weapons, the rest resulted from beatings, stabbings and other unspecified methods. Until the 1985 conviction of members of the Jewish Terrorist Network, no settler had ever been tried and convicted of murder committed against Palestinians. Most of the attacks involving shooting occurred as settlers attempted to enforce "law and order" in the territories by dispersing demonstrations or avenging acts of resistance by Palestinians. Some of the apprehended Jewish terrorists are repeated offenders, for example, Natan Nathanson of Shilo, who was charged with murder in 1985 for planting a bomb in Mayor Bassam Shak'a's car in 1980, shot three Palestinian youths near the village of Sinjil on 17 March 1982, killing one of them. Charges against Nathanson for the 1982 attack were initially reduced from murder to manslaughter, then dropped altogether. He was released to pursue his leading role in the Jewish Terrorist Network until his arrest in April 1984. Injuries: About 45 percent of all 19 1 reported injuries were the result of gunshot or hand grenade attacks. The majority of victims were males, of whom 25 percent were children. A large percentage of serious injuries occurred during attacks by settlers on public demonstrations, private property and holy places. Abductions: Two thirds of the 38 reported cases of kidnapping by settlers were children. All victims were males. In many instances the abduction ended in physical abuse. One case, at least, ended in murder. 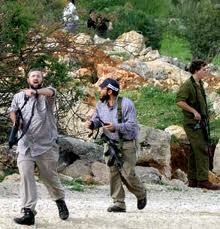 Harassments: Settlers engage in this type of terrorist activity on a routine basis throughout the occupied territories. These acts include threats, beatings, humiliations, illegal search and seizure, setting up checkpoints, rampaging through Arab neighborhoods and villages and other forms of intimidations and insults. Attacks Against Property: Attacks covered under this category are the most frequent form of settler terrorism. They include seizure of farm land through the use of force or fraudulent means, the uprooting or destruction of crops, theft and destruction of livestock, vandalism, arson and trespassing. In the course of carrying out such attacks, settlers often resort to the use of firearms, hand grenades and firebombs. This form of settler violence illustrates the active and aggressive strategy of the settlers in "redeeming" land from the Arabs on the basis of what they perceive ideologically as a Jewish historic right to all of Palestine. In addition to land and homes, settlers have frequently targeted private businesses and automobiles. Attacks On Public Places and Institutions: Armed attacks and bombings of public and holy places such as markets, public squares, churches, mosques, schools and colleges, coffee shops, municipalities, newspaper offices and charitable organizations have reached about 100 such incidents between 1980 and 1984. In addition to seeking to inflict injury on the largest possible number of civilians, these attacks are ideologically motivated since the public institutions they target symbolize Palestinian nationalism or represent a challenge to Israel's unrelenting campaign to Judaize Arab land. The latter explains the deep hatred harbored by Jewish settlers for the very existence of Christian and Muslim holy places in "Greater Eretz Yisrael," particularly in key locations revered by all three religions — Islam, Christianity and Judaism. These are the number of incidents reported to the press, and confirmed by at least one Israeli source. Deaths are the number of people killed by settlers in civilian roles. Injuries are the number of people seriously injured in attacks by settlers in civilian roles. Abductions are the number of persons abducted or kidnapped by settlers in civilian roles. Harassment comprises the number of incidents and includes threats, gunshots, defilement, humiliation, beating, rampages, demonstrations, roadblocks, checkpoints and chasing. Land Incidents comprise the number of incidents including seizures, settling, working, fencing, destruction, poisoning, land fraud, and other illegal or unauthorized actions. Animals are the number of animals stolen, injured or killed. Homes/Shops are the estimated number of affected private buildings, by demolition, vandalism, attempted or actual take-overs. Vehicles are the estimated number of vehicles (cars, trucks, buses) and include arson, bomb/grenade attacks, and smashed bodies/windows. Public Places are the number of attacks on public places, facilities and institutions (markets, public squares, municipality or court buildings, newspaper offices) by bombs, arson, vandalism. Schools are the number of attacks on kindergartens, elementary and secondary schools and colleges. Religious/Holy Sites are the number of attacks on religious institutions (mosques, churches, convents, monasteries) and holy sites (Haram al Sharif, Caves of Patriarchs) by unlawful trespass, bombs/ grenadesf gunshots, arson, vandalism. Between 1984 and December, 1987, when the Intifada began, the same pervasive pattern of violent crimes committed by Jewish settlers in the West Bank and Gaza continued. After the outbreak of the Intifada it escalated as the Israeli authorities utilized their settler mercenaries in their attempts to crush the Palestinian national uprising. The Jewish settlements were established in the West Bank and Gaza by using money from two sources, namely from the Jewish Agency Settlement Department and from the budget of the Israeli government. The Jewish Agency Jerusalem Section obtains all of its budgets from the Jewish Agency in New York, which, in turn takes the money from the United Israel Appeal, which receives its funds from the United Jewish Appeal. In other words, tax-exempt contributions of United States citizens are being used for the establishment of settlements which, since 1967, the United States Department of State has consistently stated are in violation of international law. The other funds obtained for the establishment and maintenance of these settlements come from the budget of the Israeli government. which obtains massive financial aid from the United States Government. (Finance Minister) Shimon Peres allocated 35 million Israeli shekels for new settlements on March 23, 1989 after almost two weeks of protracted negotiations between the Likud and Labor factions of the Knesset finance committee. This was slightly over half the 64 million shekels asked for by Prime Minister Shamir. The funds are to be taken from existing budget reserves and given to the new Housing Minister where they are to be used for "strengthening existing ... settlements and for establishing new ones. Despite this apparent victory, Gush Emunim and its Knesset allies have begun lobbying the government for additional funds, ostensibly to offset the ''hardships" suffered by the settler community as a result of the uprising. In reality any new funds raised through this lobbying effort will most likely be used to finance the building of additional settlements. Contrary to the image projected in the United States by the Israeli government and Zionist organizations, the Jewish settlers are hardly self-sacrificing pioneers of virgin lands. In fact they are paid mercenaries, albeit ideologically motivated to commit crimes without any qualms of conscience. Without the massive subsidies. translated into providing housing and employment for the settler terrorists, there would be no settler terrorism in the West Bank and Gaza. Criminal acts committed by Jewish settlers against Palestinians do not deprive their perpetrators of material subsistence, but are financially rewarding in that economic subsidies are always continued to settlements whose members commit such crimes. Thus Jewish settlers commit arson in order todestroy proof of Arab land ownership and then commit extortion in order to force Arab landowners' acquiescence to the transfer of their properties to the Jewish National Fund and Israeli companies. The Jewish National Fund which is also a tax-exempt organization in the United States, collecting annual tax-deductible contributions from citizens of the United States, Canada and the United Kingdom, is an agency of the Israeli government. All the lands which were usurped from the Palestinian Arabs since 1948 in the areas of so-called Israel today were registered in the name of the Jewish National Fund. All the lands usurped from the Palestinian Arabs in the West Bank and Gaza from 1967 until 1989 were registered in the name of the Jewish National Fund. The Jewish National Fund establishes subsidiaries to administer these settlements. Thus the Jewish settlers act with strong-arm gangster methods of intimidation and extortion on behalf of the Jewish National Fund. Directors of the Jewish National Fund and the Jewish Agency are accomplices of these criminal acts committed by Jewish settlers. The American Jews who contribute to the Zionist organizations sponsoring the Jewish settlers in the West Bank and Gaza are willfully or unwillfully aiding and abetting the commission of crimes. As many of the settlers are fanatic American Jews, there is very little excuse for pleading lack of knowledge of the criminal use of their contributions. 1. Report of the Special Committee to Investigate Israeli Practices Affecting the Human Rights of the Population of the Occupied Territories, dated 24 October, 1988, United Nations Document A/43/694, pp. 102- 103. 2. Anthony Lewis, "A Warning Signal," New York Times, May 7, 1984, p. 19. 4. Ze'ev Schiff, "The Military Potential of the Settlers," Ha'aretz, November 15, 1985. Published in Israel Source, volume 2, April 2, 1986, pp. 15-16. 5. Meron Benvenisti, 1986 Report: Demographic, Economic. Legal, Social and Political Developments in the West Bank (Jerusalem: The West Bank Data Base Project, 1986), p. 75. 6. Ze'ev Schiff, "The Military Potential of the Settlers," Ha'aretz, November 15, 1 985. Published in Israel Source, volume 2, April 2, 1986, pp. 15-16. 7. New York Times, 6 November. 1985, p. 15. 9. Sally V. Mallison and W. Thomas Mallison, "Legal Postscript: The Law Applicable to Israeli Settler Violence in Occupied Territories," in Israeli Settler Violence, pp. 78-82. For a detailed analysis of the judicial system under Israeli occupation see Raja Shehadeh, Occupier's Law: Israel and the West Bank (Washington, D.C.: Institute for Palestine Studies, 1985), pp. 76- 102. 10. The Karp Report: An Israeli Government Inquiry into Settler Violence Against Palestinians on the West Bank (Washington, D.C.: Institute for Palestine Studies, 1984), pp. 35-49. 11. David Zucker et al, Research on Human Rights in the Occupied Territories 1979-1983 (Tel Aviv: International Center for Peace in the Middle East. 1983), pp. 47-59. 12. Meron Benvenisti, 1986 Report, pp. 70-71. 13. Amnon Rubinstein. "Some Remarks on Jewish Terror," Ha'aretz, 22 May 1984. Israel Shahak, Shahak Papers, Collection No. 2: Background to the Jewish Terror, pp. 11-13. 14. Uriel Ofek, "Thou Shalt Not Kill? Not Always!," Davar, 6 July 1984, Shahak Papers, Collection No. 4: Background to the Jewish Terror, pp. 11 - 13. 15. Pe-er-Li Shahar "Yuval Ne'eman: In 1945 a Palmach Unit Castrated an Arab," Hadashot, 11 May 1984. Shahak Papers, Collection No. 3: Background to the Jewish Terror, pp. 1-2. 16. Chicago Tribune, 13 July 1985, p. 1-2. 17. Davar, 2 May 1984. Shuhak Papers: Collection No. 1: Background to the Jewish Terror, pp. 1-2. 18. Robert I. Friedman, "In the Realm of Perfect Faith: Israel's Jewish Terrorists," The Village Voice, 12 November 1986, p. 17. 19. Jan Abu Shakrah, Israeli Settler Violence in the Occupied Territories, p. 15. 20. The Karp Report pp. 38-39. 21. Abu Shakrah, Israeli Settler Violence in the Occupied Territories, pp. 14-36. 22. Jan Metzger, Martin Orth and Christian Sterzing, This Land is Our Land: The West Bank Under Israeli Occupation (London: Zed Press, l983), pp. 30-31. 23. Report of the Special Committee to Investigate Israeli Practices Affecting the Human Rights of the Population of the Occupied Territories, dated 4 October 1985, United Nations Document A/40/702, p. 55. 24. Report of the Special Committee to Investigate Israeli Practices Affecting the Human Rights of the Occupied Territories, dated 29 October, 1984, United Nations Document A/59/591. pp. 58-66.